When performing a laparoscopic surgery, the surgeon makes several small (0.5 - 1 cm) incisions in the abdomen. A small tube or “port” is then passed through each incision, allowing access to the abdomen. The surgeon uses these ports to insufflates the abdomen with carbon dioxide gas which separates the abdominal wall from the bowel underneath and provides a working space for the surgeon to work. A long thin optic telescope with a camera attached at the end outside the abdomen (known as a laparoscope) is passed down one of the ports. This shines a light inside and also enables a high definition image to be displayed on high definition video monitors in the operating theatre that the surgeon then uses to perform the operation. The operation is performed using a range of long thin instruments which are pass ed through the other ports. The surgeon manipulates these instruments while watching the video monitor. The laparoscope with attached camera is usually held by an assistant while the surgeon uses both hands to manipulate the instruments. This system allows the surgeon to perform the same operations as traditional surgery but with smaller incisions. How does laparoscopic colorectal differ from conventional bowel surgery? Up to relatively recently, most colorectal operations were performed through a single incision in the abdomen. Patients undergoing this type of surgery may face a long and difficult recovery because the traditional “open” procedures tend to be more invasive. In most cases, surgeons are required to make a long incision. Surgery results in an average hospital stay of a week or more and usually 6 weeks of recovery. What bowel conditions can be treated with laparoscopic surgery? Laparoscopic surgery is as safe as traditional open surgery. At the beginning of a laparoscopic operation the laparoscope is inserted through a small incision which allows the surgeon to inspect the abdomen to determine whether laparoscopic surgery may be safely performed. If there is a large amount of inflammation or adhesions, or if the surgeon encounters other factors that prevent a clear view of the structures the surgeon may need to make a larger incision in order to complete the operation safely. Any intestinal surgery is associated with ­certain risks such as complications related anaesthesia and bleeding, leakage from the bowel join if one is performed, wound infections or other infectious complications. The risk of any operation is determined in part by the nature of the specific operation. An individual’s general heath and other medical conditions are also factors that affect the risk of any operation. You should discuss with your surgeon your individual risk for any operation. When laparoscopic bowel cancer surgery was first introduced, there was concern that the technique might not give as good cancer results as open surgery. However, a large number of studies involving thousands of patients have conclusively shown that in experienced hands and for appropriate cases, laparoscopic colorectal cancer surgery is at least as good as open surgery in terms of getting rid of the cancer. It has the added advantage of a faster recovery, smaller scars and fewer wounds problems such as infections and hernias. Am I a candidate for laparoscopic/keyhole surgery? Although keyhole surgery for bowel cancer and other bowel conditions has many benefits, it may not be appropriate for some patients. A specialist colorectal surgeon will be able to discuss with you if they feel that open or laparoscopic/keyhole surgery is appropriate for your condition. A number of factors are taken into consideration. The most important being the laparoscopic experience of the surgeon, the nature of the condition that requires surgery and your fitness for surgery as well as information on previous surgeries that might cause adhesions or scarring in the proposed operation area. Can all bowel operations be performed through keyhole surgery (laparoscopically)? The short answer is no! Your colorectal specialist will discuss the options with you. It may not be technically possible due to a number of factors including scarring from previous surgery. On a few occasions, an operation may be started laparoscopically and subsequently converted to an open operation due to technical factors such as bleeding or inability to clearly see and recognise the area to be operated on. What happens if the operation cannot be completed by keyhole surgery? Do all surgeons perform laparoscopic colorectal surgery? 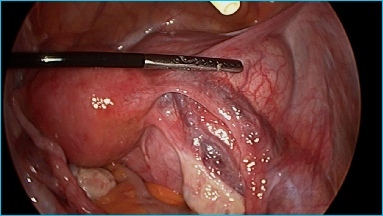 Up to relatively recently, not many colorectal surgeons had trained in the specialist techniques required to perform laparoscopic colorectal surgery. However, many colorectal surgeons have now trained to perform laparoscopic colorectal surgery safely and experienced laparoscopic colorectal surgeons now perform the majority of their major operations using a laparoscopic or “keyhole” technique. Can I undergo laparoscopic or keyhole surgery for bowel cancer or other bowel conditions at the Glasgow Colorectal Centre? Yes. The Glasgow Colorectal Centre surgeons Richard Molloy and Graham MacKay are both experienced laparoscopic colorectal surgeons and both are actively involved in training younger surgeons the specialist techniques required to be able to perform this type of surgery safely and effectively in order to obtain the excellent results that patients expect. 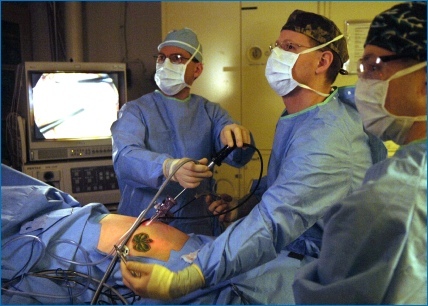 Laparoscopic colorectal surgery, (also known as “keyhole” or “minimally invasive” surgery(MIS)) is a specialised technique that allows bowel cancer surgery and other colorectal surgery operations to be performed through several small “keyhole” incisions. It facilitates Enhanced Recovery After Surgery (ERAS) with a faster recovery, less pain and fewer wound problems compared to traditional open surgery. How is laparoscopic surgery performed?How does laparoscopic colorectal differ from conventional bowel surgery?What are the advantages of laparoscopic surgery?What bowel conditions can be treated with laparoscopic surgery?How safe is laparoscopic surgery?Am I a candidate for laparoscopic/keyhole surgery?Can all bowel operations be performed through keyhole surgery (laparoscopically)?What happens if the operation cannot be completed by keyhole surgery?Do all surgeons perform laparoscopic colorectal surgery?Can I undergo laparoscopic colorectal or keyhole surgery for bowel cancer at the Glasgow Colorectal Centre? If you have any questions or wish to find out more information about about laparoscopic surgery, your own GP is often the best first port of call.